The following is an excerpt from What the Poets Are Doing: Canadian Poets in Conversation, which will be published by Nightwood Editions in late November 2018. The book will feature conversations between twenty-two of Canada’s top modern poets. Phoebe Wang: The first book I read of your work, Birds, Metals, Stones & Rain, felt like a culmination. What struck me most vividly about your poetry was its uncluttered diction, its plainsong. There’s a notable quality of accessibility and earthiness, yet it’s far from simple. This quality is something I strove—am still striving—to achieve in my own work. Was your sense of diction present in your earliest books or did you arrive at it later? Russell Thornton: In the handful of years before Birds, Metals, Stones & Rain I was lost in income-getting. I was blackening pages but not typing up many poems. So if I reached a culmination with that book, I wasn’t aware of it. Who knows what my unconscious was doing while I was occupied with bills and debts; time takes care of culminations whether you think you’re involved or not. At some point, I read through my notebooks, concluded I had a manuscript and sent it off. It felt like the first time I’d done that sort of thing. I can say that uncluttered diction and accessibility are important to me. I don’t go to poetry to be shown how clever or fashionable or purposely befuddling a poet can be, or how self-admiringly quirky a poet’s images or references are; I go to poetry to be ushered into the depths of human experience—ordinary or strange and dislocating or both—through language. I see genuine poetry as carrying out imaginative operations that have no truck with murky diction and inaccessibility. Of course, accessibility is a tricky notion. I think my favourite poems by others are understandable enough on the regular comprehension level, even by people who don’t read poetry. At the same time, there’s a weighty momentum in these poems; they’re informed by deep awareness of the human situation and by astonishing apprehension of ideas. I feel they look back at us from the far side of complexity. I think of William Blake’s “The Tiger.” I think of Elizabeth Bishop’s best poems, which are for me almost painfully clear and accessible. My inner list goes on. What about Ezra Pound’s “The River- Merchant’s Wife: A Letter”? I think it’s an example of marvellously fine accessibility. I think you play off this poem in an uncluttered and meaningful way in your own piece after Li Po, “The Child-Bride: A Letter.” I used to wonder why poets such as Shakespeare and Dickinson and Yeats appealed to me more than most other poets. Was it a coincidence that their poems were accessible yet held the deepest store of meaning and magic? I realized that for me they touch at profound orders of consciousness precisely because they achieve what I’d call a near-miraculously uncluttered and extraordinarily subtle diction. “Tomorrow, and tomorrow, and tomorrow” and “Never, never, never, never, never” are among the greatest lines for me. Plainsong and earthiness are beautiful words. And the songlike, ritualistic aspect of poetic language has drawn me in since I was a small child. That religious quality in intense use of language—as in a chant of supplication to or praise of unknown, invisible powers—is at the core of what I call poetry. That chant within plainsong arises not only out of flesh, but also out of earth. There’s a hypnotic medieval English poem that states, “Earth out of earth is wondrously wrought.” I love that line. I connect uncluttered diction and accessibility with passionate poetic utterance—and integrity. I think I see integrity in authentic poets. Is it a refusal to surrender to bs? I wonder what you think. Wang: Your views on this poetry and how it should resonate deeply across time and space contain many echoes for me, though I arrived at a similar stance by different paths. I’m drawn to using a more accessible diction partly because of the English that I heard at home growing up. My parents aren’t native English speakers but they picked up idioms from movies and songs: Bob Dylan and Joni Mitchell. They’re also both visual artists who are susceptible to absorbing their environment. At the same time, they connected me with my heritage by speaking Cantonese at home. My parents are fond of proverbs that stress humility and the ironies of life. I never thought I could write for the whole of the human condition because my poems are inflected with my identity as female, Asian, able-bodied, cis-gendered and a first-world consumer. Like you, conceits and cleverness for their own sake are a turnoff, and I’m drawn to poetry that carries a weighty momentum, like the striking of a bell. That is how I try to determine this thing called “poetic integrity,” by knocking on the sides of a poem and seeing whether the whole thing disassembles. As a student, I searched for poetry containing that sonorous quality. I craved combinations of words that would unlock worlds and send me careening into another time. I found it in poets like Theodore Roethke, Wisława Szymborska, Seamus Heaney, Elizabeth Bishop, Gwendolyn MacEwan, Bronwen Wallace, Margaret Avison, P.K. Page, Anne Carson and Al Moritz, who was my mentor at the University of Toronto. These are poets who have the ability to be incantatory and, as you say, hypnotic. These days it’s Carl Phillips and the new generation of poets of colour, but I’m always restlessly searching for poetry that taps into those silver veins of power. Yes, there is so much song in “earth out of earth”—we have come crawling out of earth and are laid back into it. I’m not religious but the idea of the religious quality of language as a “chant of supplication to or praise of… invisible powers” appeals. I wonder how language, song, poetry might be an act of faith or a plea to an invisible force since that was its original purpose, whether it be proverb or hymn. It seems to me we’re more in need of such acts than ever. Is writing an act of faith for you and is being in nature a part of your search for earthiness and poetic integrity? What kinds of truth can we find in the natural world that we cannot in that world of the so-called civilized human, and how might we bring those truths and messages into our poetry? Thornton: It’s fascinating how people’s early lives spin out into adult destinies. And interesting to me how you and I had different childhoods but still intersect in certain ways. I remember when I was six or seven seeing my father’s Bob Dylan records lying around. And my father, like your parents are now, was a visual artist. But my parents split up when I was eight; I didn’t see my father after that. They’d had to get married when my mother got pregnant with me at fifteen. I grew up with my mother and my three younger brothers on welfare. Interesting too, how you and I acquired bs detectors. For you, it was your Chinese background, your Cantonese-language household. My own identity became clear to me around grade four: my brothers and I were white trash. My predominant feeling in my community was fear: fear of being without food and shelter, fear of not being able to stay together as a family unit, fear of local predatory men who sexually assaulted my “welfare witch” mother, fear for my brothers’ safety… I felt fear and anger. It gave me a particular outlook; it alerted me to irony. No matter how many grades my brothers and I skipped at school or how many athletic awards we won, we were not going to gain membership in what we saw as “the club.” We were not going to enter a door to any home more than halfway up the North Vancouver hill. The much wealthier West Van? I wanted to dynamite it. But the bottom line, default setting for me about what was human was clicked on in grade nine when I read the phrase Shakespeare put in Lear’s mouth and saw we were all versions of “a bare forked animal.” And there’s the adjective a few words away: “unaccommodated.” This was and still is the norm for me. I like your test for poetic integrity: “…knocking on the sides of a poem and seeing whether or not the whole thing disassembles.” Yes, authenticity doesn’t topple at a tap or two. And I like your list of poets who access “silver veins of power.” These days, I often get my glimpses of that power in places I don’t expect. I picked up a Robert Burns Collected recently and suddenly the poem “A Man’s a Man For A’ That” pierced me. Yes, I’d say that for me poetry is an act of faith. I don’t mean religious faith. I use the word God in my poems, but to signify the unknown, as with the x in mathematics. And I love the Bible as a sublime literary work. “The Song of Songs” is my favourite poem. But I’m not religious in any conventional way. And so by act of faith I mean an act of life-affirming imagination. My touchstones in this are William Blake and D.H. Lawrence. I think great poems, no matter how harrowing the nightmares they may tap into, in their revelling in language say a supreme yes to life. I’ve always turned to the natural world to align myself with what I feel are un-outflankable realities. Maybe civilization itself is, as D.H. Lawrence said, a disease. And nature is imagination itself, as Blake said. I love Wordsworth’s rhythms and imagery but I can’t locate piety in nature. What I can see in nature is ruthless creativity. 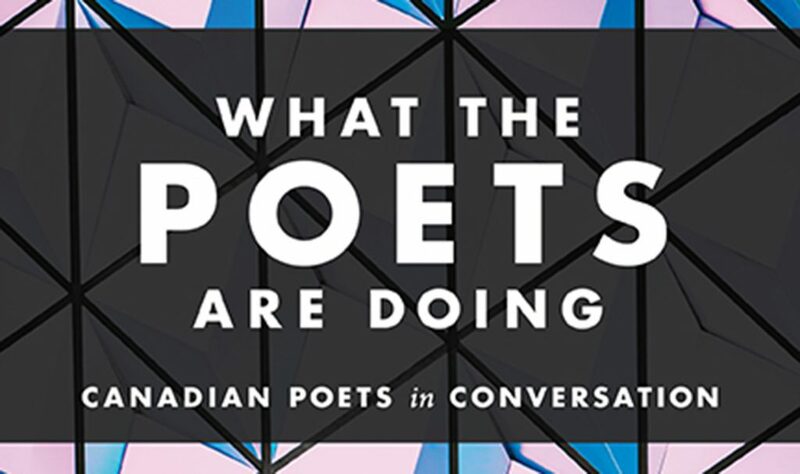 Excerpted from “The Striking of a Bell: Russell Thornton and Phoebe Wang” in What the Poets Are Doing: Canadian Poets in Conversation, edited by Rob Taylor. A Nightwood Editions title, distributed by Harbour Publishing. Available for order here. What the Poets Are Doing will be launched in Victoria on November 17th (The Bent Mast, 7 PM) and Vancouver on November 18th (VPL Central Branch, 1 PM).